I was recently at a sushi restaurant in Chicago satisfying a seafood craving and I struck up a conversation with the owner who was tending the bar about her wine list. It was a standard wine list, that is to say it had an equal number of reds and whites all reasonably priced and nothing too interesting. As I sipped my dry, gin martini I inquired what wines were her big sellers. She rattled off some of the whites which was no surprise, but then also listed some of the reds which given the reds that they were made me more disappointed than surprised. Finally, after I reaffirmed my conclusion that people generally have no idea what wine to pair with sushi, she thew in her words of wisdom: “Drink Saké!” Since this was followed by a free saké tasting, I wasn’t one to object. But that conversation got the gears turning again about pairing wine with sushi. Pairing wine and sushi can be a difficult thing. Not because it is impossible, but because there is a lack of information. When searching for a good wine pairing to go with just about any other type of meal, the internet is our friend. What wine would go with this pasta dish I’m having? Google it and gather a consensus. What meal would go with this wine I just picked up. Google it and gather a consensus. Yet, when it comes to pairing wine with raw fish, rice, soy sauce and wasabi, the internet, whom we thought our friend, leaves us hanging in our time of need. Since there is a lack of information, I will be adding some data into the ether-sphere through this captivating mini-series. This first part will summarize all of the existing knowledge on pairing wine and sushi that exists on the internet today. The next part will get into how the food components should match or should not match the wine components and I’ll probably round the whole thing off with a good trial of pairings to verify what works and what does not. To narrow my focus, which no one else has appeared to do, I’ll be sticking to the items and terminology that are common in a sushi restaurant found in the USA: Sashimi (Just the fish), Nigiri (Fish, rice, dab of wasabi) and those gigantic rolls that you might choke on when you put the whole thing in your mouth in one bite. I’ll also include the condiments: wasabi, soy sauce and pickled ginger. This is to say, I’ll be focusing on Americanized “sushi”, because let’s face it, that’s what most of us have access to and are likely to eat. My favorites [sic] were the ones that threw caution to the wind and just decided to pair the sushi with whatever wine they liked and call it a day. The standard wine rags were non-commital at best and what was really surprising was that not even the experts would state why things did or did not work (and don’t you want to know why?). There was debate about judiciously dabbing your soy sauce or giving your sushi a good dunking in it, a certain amount of ruckus over umami and a curiously awed stance over what kind of spiciness wasabi really is. Most of all, what floored me was that there was rarely any mention of the wine enhancing the meal as it should. Reviews were neutral at best if any final conclusion was reached at all. Generally with wine and food pairings you can always look to what is traditionally served together: “What grows together, goes together.” But mid-Pacfic coast Asia doesn’t have a long tradition of grapevine growing and winemaking…so that’s out. I’d contend that pairing wine with sushi is a new thing in the sense that it doesn’t have a long history of trial and error. Therefore, the current lack of information on the subject is certainly forgivable. One thing to note here is that concerning sushi, we are not pairing food with wines that are crafted to be a part of this meal. This isn’t an impossible task as it has been done numerous times before, but it is difficult when introducing food components that don’t exist in other wine-friendly cuisines. 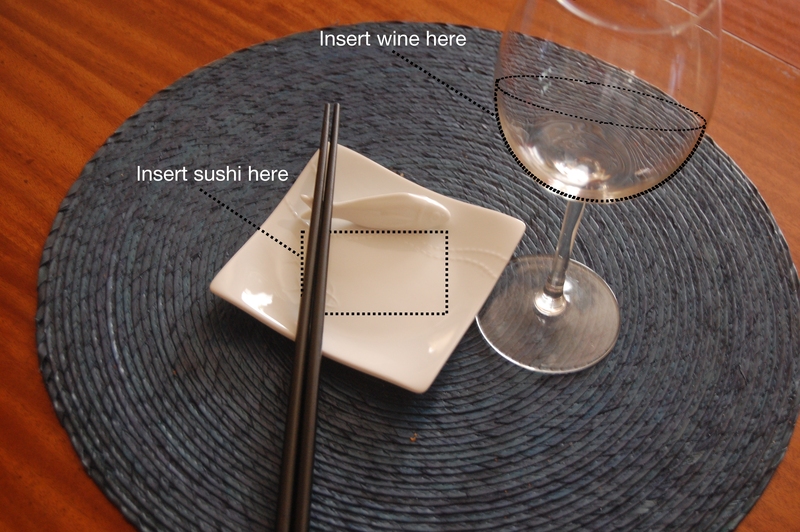 The intent from here on out is to analyze what makes up the sushi meal and what wine components work best (if any) in a way that will enhance the sushi experience.